Apple's film "The Bucket" was shot on iPhone XS by Jia Zhangke. 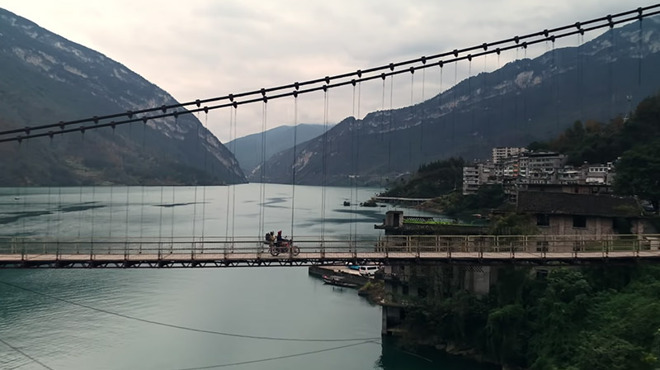 Titled "The Bucket," Jia's film uses footage pulled from iPhone XS to tell the tale of a son traveling from his rural hometown to an apartment in the city, riding on bikes, ferries and buses while carrying precious cargo from his mother. "What gifts would your parents prepare when your Chinese New Year visit comes to an end?" Apple asks in the video's description. Like last year's film, "Three Minutes," the short by Jia highlights the close family bonds and familial responsibilities that stand at the center of Chinese culture. Apple also posted two behind-the-scenes featurettes detailing how Jia worked with iPhone XS to create the film. The first covers slo-mo footage, a key feature touted in Apple's iPhone marketing material. "Besides dialogue or narration, the best way to tell a cinematic story is through movement," Jia says. "Love feels deeper when it's silent. When time slows, the feeling of love lasts longer." A second video spotlights Depth Control, an iPhone XS capability that allows users to dynamically adjust perceived depth in a photo or video in real-time using the built-in Camera app. The feature rolled out for iPhone XS alongside iOS 12.1 last October. The film debuts amid an iPhone sales slowdown in China that forced Apple to revise down guidance for its first fiscal quarter of 2019. To stoke demand, Apple recently slashed reseller pricing for iPhone XR units sold in the region. The iPhone XR, with its mix of advanced features and a relatively affordable price point, was expected by many to account for a bulk of 2018 model year sales. What equipment did he use to get the shallow depth of field for video? The article also mentions iOS 12.1. having the ability to ”dynamically adjust perceived depth in a photo or video in real-time using the built-in Camera app”, but that is not possible in video. For video it would be a game changer. There’s one shot in the video where the guy is holding the phone close by (in focus) and the rest is blurred. It’s a smart trick - with such a small sensor you really need to bring the subject extremely close to the lens to have the sense of ‘depth of field’. But other than that I think the description in the article is wrong - you can’t do it with video. Yes but the whole video has parts where there is shallow depth of field that is not possible on a smartphone. Look closer. Almost every scene or cut has some sort of shallow depth of field that is only possible with a large aperture.